A debug visualizer that renders a lambda expression as a binary decision tree. Rendering complex lambda expressions as binary decision trees makes them easier to reason about for technical and non-technical users. Trace the flow through the decision tree followingTrue and False branches at each node until a leaf is reached. Note: The expression must be bound to a variable to support debugging tool tips and, therefore, debug visualizers. See the code below for an example. Usage: Hover over a lambda expression variable name ('expr' in the below examples) whilst deugging to display its value in a tool tip. Click on the magnifying glass icon in the tool tip to load the Expression Debug Visualizer. Predicate expressions, as shown below used in a Linq Where clause, render to a binary decision tree terminating in a boolean value. 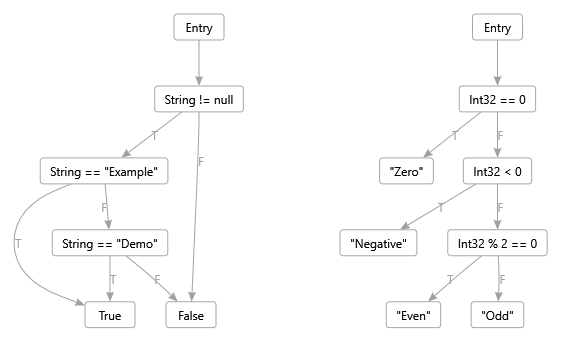 Ternary expressions, as shown below used in a Linq Select clause, render to a binary decision tree terminating in an instance of the return type defined by the expression.